A standardized material defined by the European Standard DIN EN 1561. 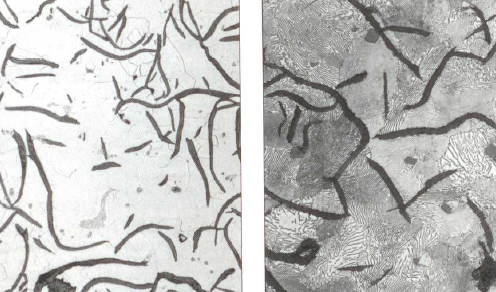 In cast condition of this material, the major proportion of carbon is mainly present in the form of lamellar graphite (s. Flake graphite, Fig. 1). 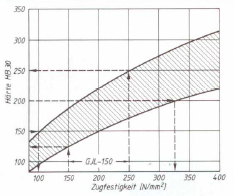 The standard differentiates between tensile strength and Brinell hardness as the critical properties required for acceptance of a cast part. Definition of the characteristic properties must be specified in the order data for a cast part. The tensile strength and Brinell hardness values to be complied with are classified in accordance with wall thickness values of the castings. Thick-walled castings have lower strength and hardness values than parts with thinner walls made of the same melt. 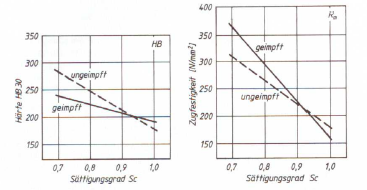 With GJL, this fact is particularly evident due to the influence of the cooling rate on graphite crystallization (Fig. 2). The ratio between tensile strength and hardness can be considerably influenced by inoculation treatment (Fig. 4). In the range of lower degrees of saturation, i.e. greater strength, the ratio Rm/HB (see Tensile strength/hardness quotient) shifts towards higher values; i.e. lower hardness is obtained with equal strength, which improves machinability of the material. At the same time, the risk of edge hardness (chill) in thin-walkled parts is decreased. High strength in flake graphite cast iron is primarily obtained through the great proportion of primary austenite during solidification. This is the main reason for the increase in strength with decreasing degree of saturation or carbon equivalent. In practice, this involves adjustment to a lower carbon content; however, relatively worse casting properties are also associated with this condition. Moreover, there is a risk of hard sections (carbide) occurring in the structure and impairing machinability. Flake graphite cast iron is predominantly produced with pearlitic structures, with the classification of grades being primarily determined by the graphite quantity and graphite shape and thus eventually by the carbon content. The higher the carbon content, the higher the graphite content in cast iron and the lower the strength values. Improvement of strength properties can be achieved by prevention of the eutectic graphite proportion i.e. through reduction of the degree of saturation, which in turn increases the proportion of primary austenite. Since lamellar graphite particles also have a stress-increasing effect, it is reasonable to keep the particles as small in size as possible, i.e. the eutectic grain count is increased, which results in improvement of strength. During cooling from molten condition in accordance with the iron-carbon phase diagram (Fig. 5), austenite is diffused along the BC line and graphite or iron carbide Fe3C, cementite) along the CD line. This primary crystallization is stopped upon reaching the eutectic ECF temperature range, with the composition of the residual melt corresponding to that of the C eutectic. The subsequent eutecticsolidification is either stable resulting in austenite or graphite, or meta-stable resulting in austenite and iron carbide. In this case, the meta-stable eutectic is referred to as ledeburite. During further progress of cooling, carbon is diffused from austenite along the ES line and crystallizes to the graphite that is already present. When the eutectoid PSK temperature is reached, austenite breaks down into graphite and ferrite (stable) or into ferrite and iron carbide (meta-stable). The meta-stable eutectoid is referred to as pearlite. These transition processes taking place during solidification and further cooling are critical for the final strength of the casting. Since highest strength is only obtained in fully pearlitic structures, it is a question of targeted, accurate pearlite formation. Consequently, when reaching the A1 temperature, there must be enough residual austenite present for transition into pearlite. The preservation of residual austenite is largely defined by the carbon content in the austenite. 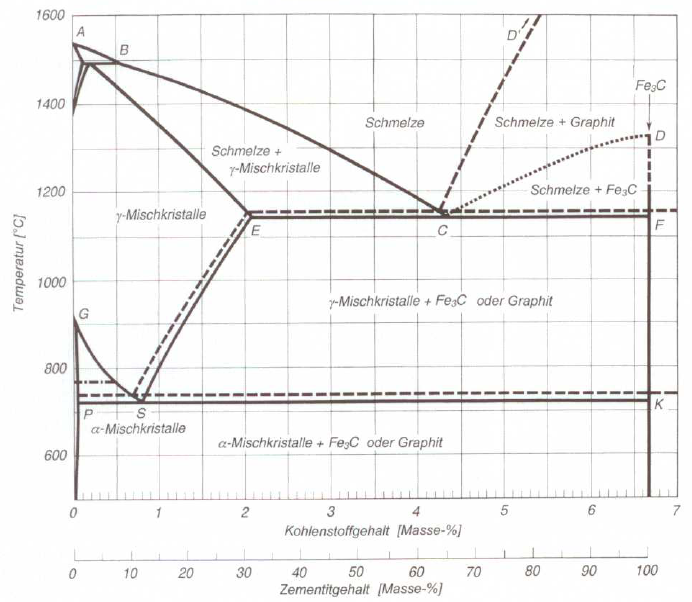 Every measure that inhibits carbon diffusion (graphitization) from austenite to graphite, increases the tendency for preservation of residual austenite. 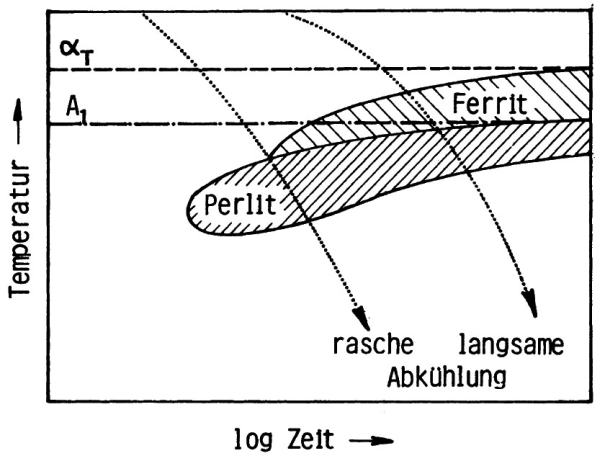 Therefore, roughly distributed graphite (A graphite) and quick cooling are useful factors for achieving a pearlitic structure because no free ferrite is formed (Fig. 6). 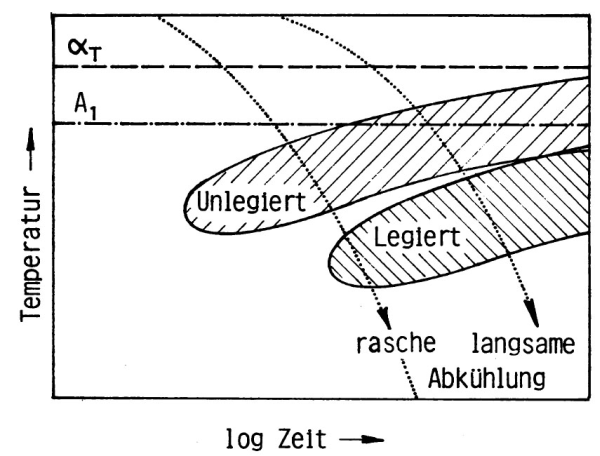 Addition of low amounts of certain alloying elements, promotes transition to pearlite shifting the field of pearlite and ferrite transformation towards longer cooling periods and lower temperatures, as shown in the TTT diagram (Fig. 7). Pearlite formed at lower temperatures is finer and consequently stronger, harder and better resistant to wear. This effect of pearlite refinement is useful for increase in strength; it is also possible to achieve this effect through hot shake-out and quenching. Frequently used alloying elements are copper, chromium, molybdenum, tin, and nickel, as well as combinations thereof. The degree of saturation is generally set to a near-eutectic value (Sc = 0.85 to 0.95).